Fieldwork during wintertime is harder than in summer, but there are no rattlesnakes. In other words - work with maps and courses is happening in a good pace - we are very happy about that. Some more visits are planned. Here are some teaser photos. The weather was OK - a bit under freezing; snow was around 2 inches or so. First picture - view of Saddle Mountain from the new map by Beverly, WA. The rest - pictures from/around the Bishop's land map. Pictures by unknown photographer from Jourdan Harvey's camera. Runners - Jourdan Harvey and Hannah Culberg. More information on the race here. 5m contours; rough open land; some cliffs; some gentle land forms. Some sage bush and few trees. More information on the race available here. The season of 2016 is starting to take shape. We are aiming for a race every two weeks, starting May and ending in First half of September. 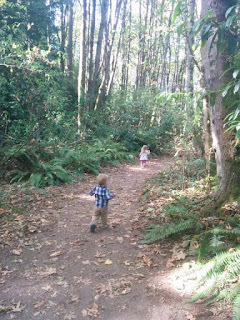 Current completely non-confirmed ideas is to have 2 or 3 races in Bridle trails, 1 or 2 in Redmond Watershed, 1 in St Edward. We are also looking for other locations and need to investigate the following - Grand Ridge, Squak and Cougar Mt, Sammamish State Park, Paradise Valley Conservation area, Soaring Eagle, and some others. Apart from that we are also looking into producing 2 orienteering races - currently the feasibility is in investigation. See you in the Forest in 2016! The course is very fast - 3.2km and 5.7km. The courses have few turns, but out from the start and into the finish is on the same trail - you may see people running against you, please be careful. Short course - 3 controls. Long course - 5 controls. No sample course this time. Trails are not closed for other users. Weather.com believes that it will be sunny; 78degF. NO RAIN. Start will be open 4pm to 6:30pm. Finish open 4pm to 7:30pm. Course pick-up will start at 6:30. Parking is South entrance of Redmond Watershed Preserve from Novelty Hill Road. Absolutely possible. 11$. See you on the trails! The Redmond watershed race is very close. Race page is here. Note that the start is open 4:00pm to 6:30pm. Weather is promised to be excellent. The courses have very little elevation and will very fast. We expect a 24 minute or so winning time for the long 5668m course; it will be a fast time for the short course of 3215m as well. 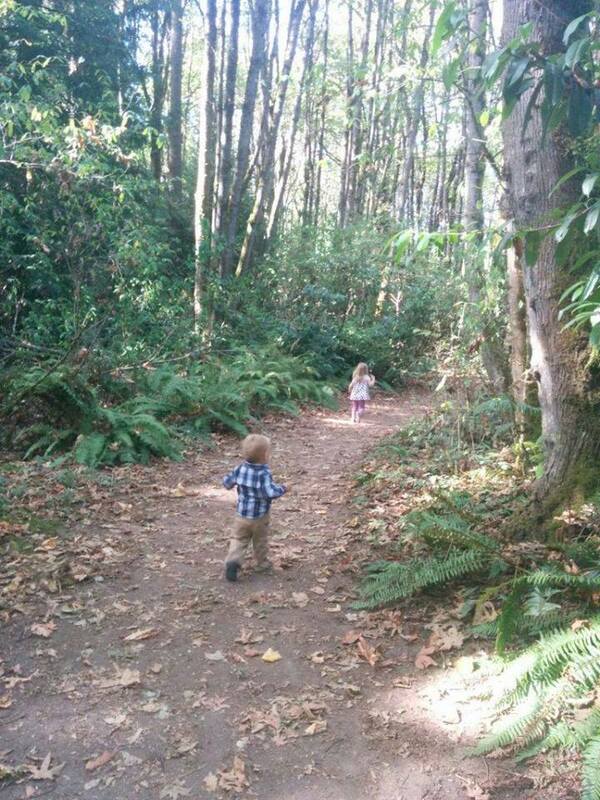 There have been some sightings of bears in Redmond Watershed park. In case that happens, King5.com suggests: "If Redmond residents encounter the bear, they can avoid an attack by remaining at a distance, creating loud noise, making themselves look as big as possible by spreading their arms, removing food items that may have initially attracted it to the area, and standing still if a bear does charge." It is quite unlikely you will get to see one though. This is the last race of the pilot season. We will continue next summer - likely May to September season; more precise information will be available later. The most interesting legs of the race are 33-34, also known as the hill and leg 35-Finish. The hill leg correlates well with overall results except for Rosemary and Julie who were faster in this leg than Debbie and Sandis, who were both faster overall. Zach from short course takes the 4th place in these splits. The finish is another game! Here Atis and Sandis ended close together forcing each other to do their best, resulting in 1:04 split for Sandis and 1:06 for Atis which matched 1:06 by the overall winner of the long. The full results do not reflect the race in the womens' field very well. Debbie won it by 4 minutes: congratulations! What regards long course winner Janis splits - they are somewhat stable, but there are also three splits where he does not take the first place. The weather co-operated. Promised rain all day yet it delivered none till after the course setup. The courses were impacted by the storm just a little bit. The courses were quite hard yet the runners enjoyed them. All people finished with full courses - we blame improved checkpoint and trail markings. Of course, there were quite many repeat forestrunners - out of 10 participants 5 had done a Forest Run before. Thank you and see you in Redmond Watershed! Murray helped a lot with picking up courses; Lisa and Gunta helped with tear down of the tents; Vija watched them while course was being set. Thank you! This might be the last post before results; we are ready to go. The long course goes down, level, up, level, down, up, level. The short - down, level, up, level. The last up will be hard. If you can run-run it, you will most likely be close to top in results. The course will be slippery on the downhills. Small-spike shoes might be useful. Other people will be on course; please respect them. Start will be open from 3pm to 6:45pm. Finish open till 7:30pm. Current forecast is some rain. 0.2 inches total tomorrow in Kirkland. We will have 2 tents. Discover pass needed! Once parked - look for the white tents. Start and finish are not at the tents. 11$. But please take your time to come - you will need to fill/sign registration and waiver. To rangers of the park - without their chainsaw skills the course would be usable for some other type of race, not a run. 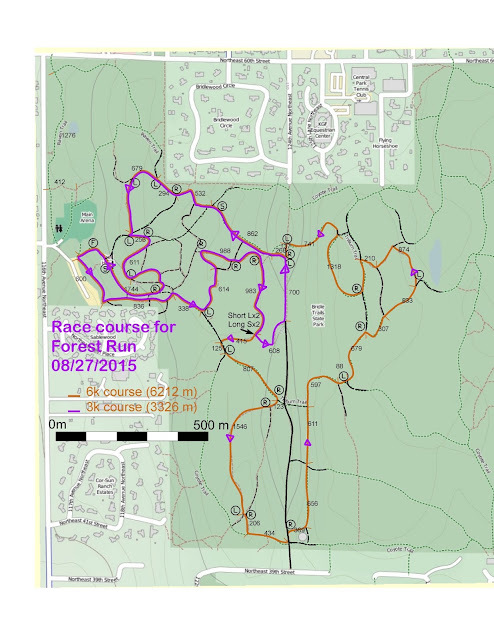 Achievement unlocked: race page/registration is open for the first race of Forest Runs: HERE. We want the price of the weeknight races be not the blocking factor for an entry. We understand that the concept of open start window is new for trail running. We also have some expenses. Therefore the price is set to be 11$ including sales tax. Which makes it be 10.05$ of price and 0.95$ of sales tax. Some paperwork is still in progress, but: the first Forest Run will happen on August 27th, Bridle Trails State Park; we have preliminary approval from the ranger! Start window: 3pm to 6:45pm. insurance; FR is trying to become a member of O USA. - We have chosen date for the first event: August 27th. - We have sent an application to the ranger, waiting for comments back. - We have a course design. 6k and 3k. Forestruns.com domain name is active now; redirecting to blog.forestruns.com. Paypal business account registered. Great! We will use Webscorer.com for registration till a better system is set up. A better system will likely be a custom webpage. For results we will use winsplits. Back home in Europe there exists a certain set of competitions for running in forests in evenings. Good time measurement for everyone, but a time window for starts. There is nothing similar here of a large scale. We will try to create this market in Greater Seattle. This year we are trying to put on 3 of these open-window races; gather feedback; get understanding whether the market actually exists here as hoped for. If that works - more races to come next year. We are currently looking for late August/September time-frame. However, park permitting is a potential blocker. Domain name is secured; LLC registration is in progress. The target audience should be pretty much everyone who has some time to run from 3pm to dusk. We hope to keep the price of this small, comparable to a lunch.